Winter is normally a time for me to regroup, center myself, and take some much needed ME time! It is a time for me to catch up on inside chores, like reading, online classes, and all those little notes I took throughout the year filled with ideas and different projects or articles. In short, winter is a great time for me to finish projects. 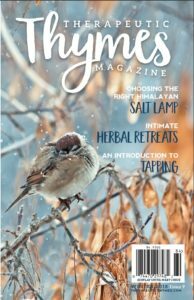 As Therapeutic Thymes enters into its third year with this issue, Year Three! It is a time when we evaluate the Past, appreciate the Present, and way the groundwork for the Future. As always, whether you are new to the holistic and self-sustaining lifestyle, or an expert in a related field, I am so glad you’ve joined us for this exciting journey. Grab a cup of your favorite tea and join us a spell.